Days and months go by so quickly that sometimes you don't have the time to sit and think how many things have happened. That's why I wanted to take the time today to make this a 'Thank You' post. One whole year has passed already since I've shared with you 'On a personal note'. So many things happened and some many things changed in just one year. In the beginning of the year I did a blog facelift and then a few months I did switch a roe again and turn it into this lovely beauty I have now. I changed my business cards with flying Mexican street artists into a colorful cards with things that has to do with my business. I managed to finish my studies of Interior Designing this year and I'm now a legit Interior Designer. Seriously, I graduated with an A on my diploma! Pretty proud about that. Then I did a promotion on my Facebook page and that went booming. That really gave me all the clients I have now and I really appreciated all the work they have brought to me and the trust they showed also to go with a new small business. Beside interior designing, I have the pleasure to do some branding and photography for small business and that is also going great. 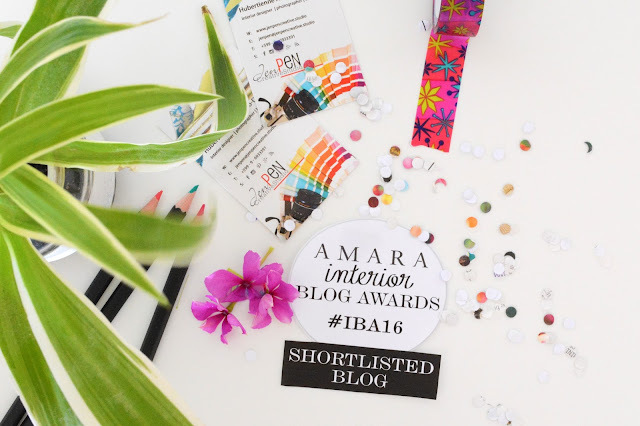 And this week I got the most awesome news ever, that my blog has been shortlisted in the category of 'Best International Interiors Blog'. Which I find to be such a honor. I mean, someone out there is ready my little ol' blog from the Curacao and that's pretty awesome. Didn't catch my happy head shake? I want to thank all of you who've voted for me and supported me since I started my business. Keep pushing me and we'll go places together. Congrats! Any award is awesome. You clearly work hard to keep a tidy blog! Good luck with the fun stuff that follows. WOW! Congratulations Huub. The entire website is very well laid out and from what I see the blog is quite helpful and if a not-so-creative dud like me can notice things, you sure are doing this perfectly right! COngratulations. I am glad all your work and changes paid off and I wish you more success for the future. Congrats on the award it's always nice to feel appreciated.